Anyway, one of my new challenges as a pet owner has been keeping said pet out of my kitchen which happens to have not one but two entryways. The kitchen is a pretty active place since I'm a stay-at-home, homeschool mom of 3. Plus, my husband works from home, too. Five people + one dog = a kitchen that is too crowded! I finally got tired of having a puppy under my feet while working in the kitchen, especially since he's a big puppy. Cooking was quickly becoming a dangerous activity! For both of us. I got tired of having to push away a furry face and a slobbery pink tongue every time I opened the fridge. Oh goodness, and the slimy slobber marks all over the fridge doors just about killed me. I got tired of worrying that this bundle of activity was going to bump into my beautiful hutch filled with meaningful treasures. I got tired of pushing big, stinky paws off of the counter tops. On a few occasions his slimy tongue sneaked licks of food on the counter. Ugh. At first my frustrations compelled me to block off both entryways with kitchen chairs. It worked, but it was neither convenient nor attractive. HUBBY TO THE RESCUE WITH DOG GATES! Even though it was a sacrifice, I am so thankful that my husband chose these Dynamic Accents freestanding wooden pet gates (handcrafted by the Amish) that keep our walls from getting scuffed up and that match our kitchen perfectly. 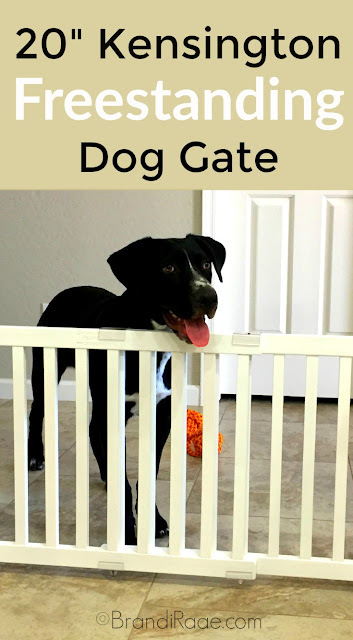 For dog gates, they're not eye sores. 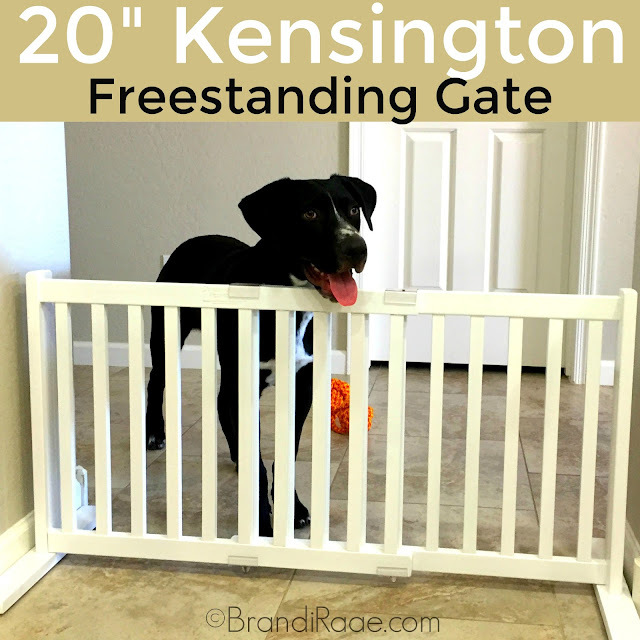 If you've been considering a dog gate, I thought I'd tell you about the ones we bought - 20" Kensington Freestanding Gate - in order to help you with your decision making. You will have to apply the support bumpers. You will have to attach the gate feet to the gate panels with a Phillips Head Screwdriver. Expands by sliding without the use of tools - super easy to do! Although the description says that the 20" gate is designed to be used with small animals that can not jump over or push gate out of position, our 60 lb. lab mix puppy who is almost 7 months old respects the barrier. He has bumped into it and has accidentally moved it a little bit, but he doesn't try to jump over or push it out of the way on purpose to get into the kitchen. It's like he KNOWS that I don't want him in there! I can't predict, though, if this will change when he's older and probably 30-40 lbs. heavier. I have a feeling that he will still respect the barrier since we are actively training him during the puppy stage. I am pleased with the way the gates look and how they blend right in with our kitchen cabinets. Like I said earlier, they're not eye sores or anything. I also like that they are made of wood and not plastic. I personally wouldn't have minded gates that attach to the walls and swing open, but because the ones we bought are only 20" high, they are easy for everyone in the family to safely step over without falling. Our youngest is 11. One of our gates came with a plastic glide that is slightly cracked. (Noted in the picture below) Unfortunate, but we didn't send it back because we wanted to start using the gates right away. We applied a piece of clear tape that seems to be doing the trick for now. The edges of the plastic glides are somewhat sharp. In fact, I cut my knee on one of them when trying to step over the gate one time. *Update: we received a brand new plastic glide to replace the cracked one, free of charge. Great customer service. This style gate also comes in a larger size standing at 30" instead of 20". 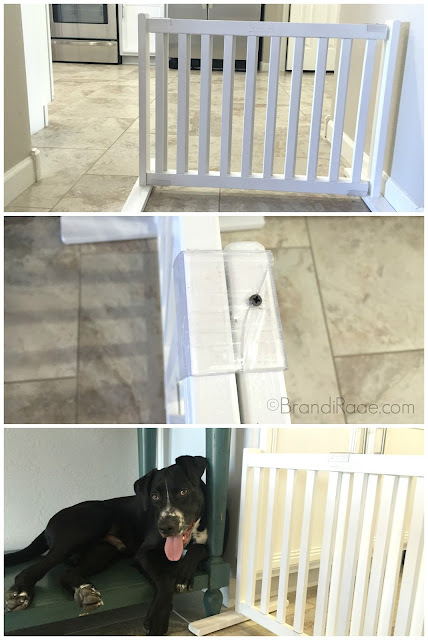 This size may be better for larger dogs, but because this style is not attached to the wall, there is still the possibility of a large dog being able to push the gate out of the way. If the 20" or 30" Kensington Freestanding dog gate isn't exactly what you're looking for, Dynamic Accents offers a variety of other pet gates that you might want to check out. *Please note that the only gate I am familiar with is the 20" gate. While this handsome puppy in the photos may have captured my heart, I still don't want him in my kitchen. I love having my kitchen back, and I love being able to enjoy my little sitting room right off the kitchen without a dog underfoot. :) Freestanding dog gates work for me! Hopefully they will work for you, too.